1. How long has your business been in existence? What was the inspiration for you to set up? This will be my 9th year in business at Court Farm Holidays in Marhamchurch near Bude, Cornwall. I had not long qualified as a reflexologist when the owner offered me a small room from which I could practise. In truth, my only inspiration or desire at that time was to be financially independent and sharing something I loved, little did I realise how much I'd enjoy learning and developing new skills! As the treatments I was able to offer grew, my services became increasingly more popular, to the point where it was felt I needed an upgrade on my very basic space and so my room was created. So in truth, just like my career move into holistic's, my room found me and if you believe in destiny then most probably I was destined to be here doing what I do and sharing what I share. 2. What attracted you to the Spiezia – Made for Life brand? How does it fit with your values as a business? My business was starting to take off and I was doing a lot of massage which was fairly heavy going on my body. I knew I couldn't sustain that level of demand indefinitely so contemplated on what a solution might look like. That's when I came across an old Spiezia brochure in the electric cupboard that a previous therapist had left behind. Intrigued, I flicked through the pages but feeling safe with what I knew, I carried on for another season offering massage after massage not realising the Universe was trying to offer me a solution. With my new room complete and my thoughts focused on developing a gentler way of working, the name Spiezia repeatedly popped into my head it got louder and louder until I recall shouting out "OKAY! I get it! I'll call!". I did and I'm so glad I did! Within seconds of speaking to Jo I knew I was being taken care of and placed my opening order and agreed to a week of spa training. I love Spiezia's ethos of using only 100% organic natural products that are kind to us and to the environment. I love that all the products look and smell so damn good! I love that each treatment is holistically inspired with the emphasis very much focused on balancing and nurturing, whilst gently supporting the recipient through a healing journey. There's a lot to love about this product and the wonderful people that produce it! 3. What are the current trends within your business? How much change have you seen? Whilst I feel the larger spa facilities are great for days out with the girls or winding down with the hubby, independent therapists like myself that offer bespoke sessions that are very much tailored to the individual needs of a client will always appeal to those that appreciate a more personalised service. I also feel that humanity is beginning to acknowledge that our bodies are exposed to far too many chemicals and pollutants and that most people truly desire a cleaner healthier lifestyle for themselves and their loved ones - cleaner air, cleaner energy, cleaner food and cleaner cosmetics! I believe this is the reason there has been such an increase in demand for natural, transparent, safe and nourishing skincare products. An appealing combination! 4. What is your customers’ favourite Spiezia treatment? Personally, I feel that all the Spiezia treatments have been so lovingly created that you'd be very happy to receive any one of them! However, a firm favourite at Court Farm a Holidays is Relax into Radiance. 5. How important is it that the customers understand the brands/products and techniques used in the spa? It is essential! As knowledge and understanding of how our skin works and absorbs products and most importantly, a further explanation of the ingredients used and the reasoning behind their use enables the recipient to make informed choices. Sharing is most definitely caring! 6. What are the five key values within your business? 7. How do you set yourself and what you offer apart from others? The World can seem a crazy place full of demands and pressures that seem to separate us from that state of just 'being'. A state, in which we can truly live as our authentic selves and at peace with others. With this in mind my focus is not on what's different or sets me apart from others but what unites me and providing a space where others can hopefully envelope themselves in that beautiful gorgeous juicy state. 8. 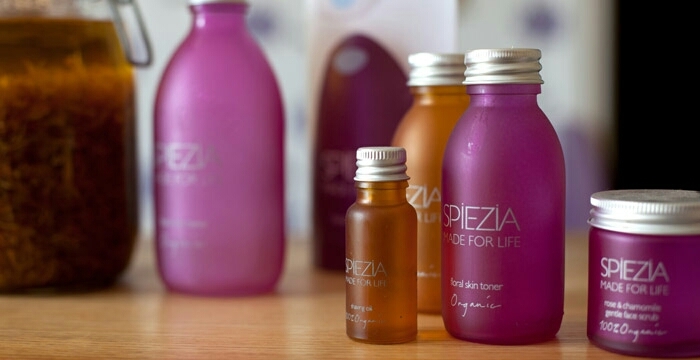 What stands out for you about Spiezia Organics – Made for Life products compared to other brands? There are a number of skincare companies focusing their energies on producing natural organic and environmentally sound products but for me very few include, not only their ingredients but their containers and packaging as well. Spiezia really care about their environmental footprint so they get the thumbs up from me. 9. What is your customer profile? How much business is repeat business? Male, female, 20 to 80 years of age mostly guests at the complex although I do have a loyal local client base as well. Court Farm is very popular with it's guests, some of whom return several times a year. Most have young families, so my on site room is very popular for parents wanting to enjoy some pampering without having to leave the complex. I also have some clients who've had holiday homes in Bude for generations who look me up when they are in the area. Folk often say they'd like to take me home with them. So should I disappear, it's most likely because I've been kidnapped! 10. What does the future hold for you and the business? I really don't have any major plans only to continue loving what I do and sharing what love. Although, I do love learning and deepening my understanding of the human body and mind so I'm sure my future won't be dull or without movement. 11. What do you enjoy in your spare time? How do you relax? That's easy #YOGA! I absolutely love yoga and how practising it makes me feel physically, emotionally and psychologically. Yoga has become a fundamental part of my life during the last couple of years, to the point where I feel I am ready to develop my own self practise further by studying a foundation course with BWY. I can't recommend yoga highly enough. It's a great way to maintain mobility, flexibility but most importantly, for me it helps to calm, relax and restore a feeling of inner peace and personal wellbeing. Alongside yoga I enjoy being outside so walking, cycling, campervaning, gardening and beach combing. As long as I'm in nature I'm a very happy bunny! 12. Name your three favourite things in life. Love, laughter and sharing in all it's forms :-) I love life! Rose & Vanilla face oil made with a whole lot of love right here in #Cornwall. 100% Natural Organic Skincare made in Cornwall using the finest eco friendly ingredients! Heavenly #facials that are kind to you and your #skin and most importantly the environment.